A new apartment or home is a chance for a fresh new start. However, if the previous tenant, the landlord, or the property management company didn’t do their due diligence, then you may be facing a few problems not mentioned in your lease. Bed bugs are a problem no one wants to deal with, especially on top of the stress of moving. 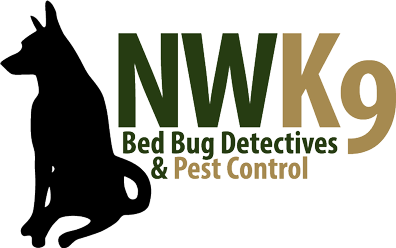 Make sure that you address bed bug problems right from the start with help from Northwest K9 Bed Bug Detectives. We offer tried-and-true canine bed bug inspections with help from our highly trained bed bug detective dog, Magic, and a variety of bed bug treatments that we can customize to your situation. Keep reading to learn the steps you should take when moving into a new apartment and call Northwest K9 Bed Bug Detectives to schedule your bed bug inspection today! One thing you can do early on in your search for a new home is to research the property’s history with bed bugs. Look for online reports on bed bug infestations, which may be compiled and publicly available through your city or township. You can also look for online reviews from previous tenants, which are likely to mention if there were any big problems with bed bugs and address how management handled the situation. Once you visit the property, you can also ask current residents about any pest problems if you decide to ask them about other aspects of the property, like noise levels or management’s response to maintenance requests. If you have had bed bug problems in your last residence, you obviously don’t want to bring those concerns with you to a new apartment. Make sure that any affected belongings are professionally treated before transporting them. You should also check to make sure you aren’t bring any uninvited guests with you — avoid buying used furniture and, if you are using a moving service or renting a truck, ask the company how they ensure their vehicles and equipment are bed bug-free. Once you have decided on a property and put down a deposit on an apartment, make sure you thoroughly inspect the space. If you have access to the apartment before move in, that’s the best time to ensure that any problems are addressed before they will affect you. Otherwise, look for signs of bed bugs when you do your initial walk-through and report it like you would any pre-existing damage. When doing your inspection, remember that fresh paint and a lack of furnishings doesn’t mean that you are safe from bed bugs. They can live for months without feeding, and even the visible signs of an infestation can be hard to spot or identify, whether you’re looking for the bugs themselves or discarded waste or exoskeletons. The best way to identify a bed bug infestation is to get an inspection from a trusted company. Dogs are far more sensitive to the world around them than humans, which makes them ideal for sniffing out a bed bug infestation that is invisible to the eye. Northwest K9 Bed Bug Detectives ensures a thorough, high-quality inspection with our own bed bug-sniffing dog, Magic, who is more than 97 percent effective at detecting bed bugs. Once we identify a bed bug problem, we offer a wide range of treatment options, from chemicals to heat treatment. Make sure you can truly enjoy a fresh start in your new Seattle apartment — call Northwest K9 Bed Bug Detectives today and learn more about how we can help!